We’d love your help. Let us know what’s wrong with this preview of Broken Arrow by Azaria M.J. Durant. Ealdred is the son of no one. A half-breed slave. Born to serve. And yet magic lives within him. When a freak accident reveals his powers not only to himself, but to the world, Ealdred is forced to flee for his life, only to fall into the hands of the dark sorcerer, Zeldek. Suddenly, he is thrown into a world he never knew existed. The legends are real, the Vaelhyreans of o Ealdred is the son of no one. A half-breed slave. Born to serve. When a freak accident reveals his powers not only to himself, but to the world, Ealdred is forced to flee for his life, only to fall into the hands of the dark sorcerer, Zeldek. Suddenly, he is thrown into a world he never knew existed. The legends are real, the Vaelhyreans of old exist, and Ealdred must choose between death and service to Zeldek. But when he meets Bellator, beautiful and treacherous servant of Zeldek, a new choice is presented to him: to escape from Zeldek’s stronghold and embark on a quest to find the cursed arrow of his ancestors and free the Vaelhyreans from the spell that holds their powers captive. To ask other readers questions about Broken Arrow, please sign up. Best Indie Authors of 2018! Broken Arrow was my project and passion between the ages of 14 and 19, and I put basically all of my struggles into it. The story and characters were very real to me, and I enjoyed writing every word. What I want most for my reader (you) as you enter the magical, epic, and dangerous world of Theara is that you are immersed in it and it can be as real to you as it was for me. I hope that the characters stick with you for a long time. But I already know you will enjoy it. Because it's a great book Broken Arrow was my project and passion between the ages of 14 and 19, and I put basically all of my struggles into it. The story and characters were very real to me, and I enjoyed writing every word. What I want most for my reader (you) as you enter the magical, epic, and dangerous world of Theara is that you are immersed in it and it can be as real to you as it was for me. I hope that the characters stick with you for a long time. But I already know you will enjoy it. Because it's a great book. I was drawn into Broken Arrow immediately, from the first page. The writing is really intriguing, and I just wanted to know what was happening. I read this book in one sitting because I couldn’t put it down. I’m really impressed with Azaria M. J. Durant’s ability to create captivating characters and beautiful descriptions. There are twists and turns at every corner. It was fast paced, and even with some more complex character names, each character felt real. I never found myself lost or trying to I was drawn into Broken Arrow immediately, from the first page. The writing is really intriguing, and I just wanted to know what was happening. I read this book in one sitting because I couldn’t put it down. I’m really impressed with Azaria M. J. Durant’s ability to create captivating characters and beautiful descriptions. There are twists and turns at every corner. It was fast paced, and even with some more complex character names, each character felt real. I never found myself lost or trying to figure out who was who. I’m a huge fantasy fan when it is done correctly, and Broken Arrow was done correctly. I highly recommend checking this one out! Broken Arrow describes such a rich fantasy world. I especially love the mix of political and magical system, it's very vast and interesting. I love reading a fantasy book with thought out setting. Ealdred is just a boy living a very hard life. Sold as a slave from a very young age and is constantly beaten and yelled at. No matter the amount of abuse, he stayed good on the inside. After particularly hard punishment, something magical happens and he has to run. This is a world where magic has become a myth. On the run gets captured and thrown in the middle of an ancient power struggle. And he just might be the most important part. After almost a year of not reading anything except school books, Azaria sent me an advance copy and I devoured this book in a day in a half. The characters are fascinating and complex, the story is amazingly developed, and the world feels completely real. While most fantasy books tend to explain their world and magic in long, dull passages, Broken Arrow explores these aspects of the story in engaging, fascinating ways. I'm excited to reread a published copy soon. “The Broken Arrow” by Azaria M.J. Durant is a high-speed adventure with twists at every turn; this book was a superb read. I could hardly put the book down! When Ealdred is captured by the vile Zeldrek, he meets an unexpected ally and they set off to find the Broken Arrow, an alleged weapon that will be able to vanquish Zeldrek once and for all. I recommend this book to anyone who loves fantasy and adventure. I can hardly wait till I forget the plot so I may read it again! I look forward to a se “The Broken Arrow” by Azaria M.J. Durant is a high-speed adventure with twists at every turn; this book was a superb read. I could hardly put the book down! When Ealdred is captured by the vile Zeldrek, he meets an unexpected ally and they set off to find the Broken Arrow, an alleged weapon that will be able to vanquish Zeldrek once and for all. I recommend this book to anyone who loves fantasy and adventure. I can hardly wait till I forget the plot so I may read it again! I look forward to a sequel. This is an awesome book. I can't wait till the next one. I read this book as unlimited and ended up following the author and actually buyi n the book. Please try it out. Broken Arrow by Azaria M.J. Durant is one of those books that I am overjoyed to name a forever favorite of mine. From the very first chapter, Azaria weaves together a wonderful fantasy filled with characters that burst with life, a world of magic, and an adventure impossible to put down. Ealdred, a half-breed slave boy, has a rare gift: magic. And Zeldek, a dark sorcerer, will stop at nothing to gain Ealdred’s allegiance, and his power. Yanked from life as he’s known it and thrust into a world w Broken Arrow by Azaria M.J. Durant is one of those books that I am overjoyed to name a forever favorite of mine. From the very first chapter, Azaria weaves together a wonderful fantasy filled with characters that burst with life, a world of magic, and an adventure impossible to put down. Ealdred, a half-breed slave boy, has a rare gift: magic. And Zeldek, a dark sorcerer, will stop at nothing to gain Ealdred’s allegiance, and his power. Yanked from life as he’s known it and thrust into a world where he is more powerful than he could possibly imagine, Ealdred has to make a choice: bow down to Zeldek or resist. That is, before Bellator, a servant of Zeldek, offers him a different option. If Ealdred helps her find a long-lost, magical broken arrow, he won’t have to give himself to Zeldek or defy him and risk death. Azaria’s writing style brings the land of Theara, its outlaws and kingdoms and lush history, into brilliant light. All I had to do was close my eyes and I could see Fyra rising up in front of me; the story unfolded like a movie in my head. I would find myself asking questions like, “Will Ealdred’s family's identity ever be revealed?” and, “How did Bellator get her scars?” that left me with no other choice but to blaze through the next chapter. And the next. And the next. The plot twists left me gaping with shock and overwhelmed with emotion. Then there are the characters. Ealdred won my heart easily with his acts of good and his kind heart, but he wasn’t the only character that drew my eye. Bellator, Ealdred’s unlikely ally, is undoubtedly my favorite character from Broken Arrow. As Ealdred and Bellator set off to find the broken arrow, joined for a while by their friends Annalyn and Uri, they are dogged every step of the way by Zeldek’s informants. Azaria takes this time to slowly unmask the outward cold, harsh demeanor of Bellator to reveal a girl who has suffered hardship and betrayal that questions everything Ealdred thinks he knows about her. Bellator kept me on my toes trying to figure out her secrets and puzzle out her plots and past. Broken Arrow pulled me into a story world that would not let me go. By the end, I was nearly in tears because I knew I only had a few more pages to spend with Ealdred, Bellator, and all the rest of the characters introduced along their quest. 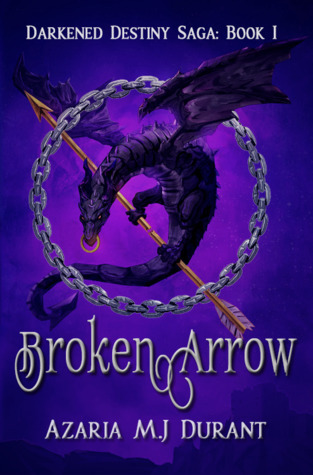 I would highly recommend Broken Arrow to readers looking for a book with complex and lifelike characters, avid fantasy readers, and to anyone who wants to read a well-written novel. Broken Arrow stole my heart, and I cannot wait for the sequel! Broken Arrow is first in Durant's Darkened Destiny series, following the adventures of half-breed Ealdred. Despised for what he is, Ealdred has been a slave his entire life. When the sorcerer Zeldek captures Ealdred and brings him to the stronghold of Gaiztoak, he learns there's more to his past than ever he realised. Zeldek tries to convince Ealdred to join forces with him. Ealdred refuses, and later is ‘freed’ by Zeldek’s general, Bellator, who is convinced that Ealdred has what it takes to me Broken Arrow is first in Durant's Darkened Destiny series, following the adventures of half-breed Ealdred. Despised for what he is, Ealdred has been a slave his entire life. When the sorcerer Zeldek captures Ealdred and brings him to the stronghold of Gaiztoak, he learns there's more to his past than ever he realised. Zeldek tries to convince Ealdred to join forces with him. Ealdred refuses, and later is ‘freed’ by Zeldek’s general, Bellator, who is convinced that Ealdred has what it takes to mend the magical broken arrow artifact of Arnon. There certainly is more to Ealdred, more than even he and Bellator know. A visit to the Valamette royal household reveals unexpected aspects of Ealdred's past. Ealdred will lose friends, and gain them, but can he gain what he most wants- his freedom? And can he learn to control his burgeoning magic before he seriously harms himself or others? I quite enjoyed this story. There were far less dragons than I expected. We see living dragons, but most often, we see them as decoration on weapons, jewelry, and brands. Still, I love Fyra for the time we see her. Maybe there will be more dragons in future books. I certainly hope so! Ealdred himself is a compelling character. A slave, Ealdred has never quite lost his will, his stubborn streak. He's been beaten near senseless, starved, and forced to watch a friend die. He has a strong sense of morality and ethics, and it is for this reason that Bellator needs him to help mend the Arrow of Arnon. The writing was a little clunky at times. There were things that could be tightened and trimmed to flow better. Another grammar/ spell check would not be amiss. I was also confused about the half-breed concept. Zeldek called Ealdred half-race, saying he is part Valhyrean, which did seem a different species actually. But half-breed seems to mean something else, like if people from one country marry someone from another country. Does that mean each country is actually a slightly different species? Half-breeds seem to always manifest with pale skin, black hair, and blue eyes. The anthropologist in me wants to understand the genetics behind this! Haha, probably just reading too much into things. That being said, I quite enjoyed this read and am looking forward to reading the next in the series. Recommended for those enjoy scifi/ fantasy! ***Many thanks to the author and publisher for providing an egalley in exchange for a fair and honest review. This book was reviewed for the XPresso Blog Tours. There were multiple times that I thought I had the plot figured out, based on assumptions/clichés of the high fantasy genre. I was always wrong. If I assumed that no one else was going to be added to the cast of characters, someone who turned out to be one of my favorites joined the crew. If I thought that chapters of the novel would be taken up with a Journey-Through-The-Fantasy-World narrative, swordfights/higher stakes/so many people with their own motivations and goals that fought against Ealdred’s were introduced. There were also quite a few plot twists that were well foreshadowed and caught me by surprise. My only con is that during the climax, Ealdred didn’t seem to be an active participant. While Bellator was, of course, also a protagonist, Ealdred didn’t contribute much to resolving his side of the plotline during the main back-and-forth. One of the best worldbuilding bits was the ‘origin myths/stories’ of how different civilizations and conflicts came to be. These stories flowed very naturally and felt similar to creation/origin stories told by real tribes and peoples today. I think the setting/descriptions were largely carried by the choice to use present tense. It made the prose clip along, instead of drag during the descriptive parts. This world really felt rich and fully imagined, and the descriptions used so many strong sensory details. “Right behind you!” Uri cries with new enthusiasm, gripping his trident with both hands. “Don’t let me spoil the fun,” I say miserably. Incredibly developed story. It had a rich world, mythology. Bountiful, beautifully written characters. A carefully built plot. Excellent play on cliches that made them feel new. This story drew me in right away. It had a great voice. It had beautiful description. It had well-written and consistent characters. It's often difficult to keep me interested or invested in a story. I get bored having read very widely in fantasy. But I had neither of those problems with this book. It kept my attention f Incredibly developed story. It had a rich world, mythology. Bountiful, beautifully written characters. A carefully built plot. Excellent play on cliches that made them feel new. It's often difficult to keep me interested or invested in a story. I get bored having read very widely in fantasy. But I had neither of those problems with this book. It kept my attention from beginning to end. It was well worth the few hours it took to read. I look forward to seeing more from this author in the future. Intriguing storyline, strong characters ( I would like the male protagonist to be stronger but I understand he has't been trained yet so) I love fantasy books and these kind of lovely book cover so this can't really go wrong with me. It is possible for you to be confused at the first few chapters, but you'll be fine! Don't worry. I like how the male protagonist develops his powers slowly, in a more realistic pace. Unlike some other books that went from a poor guy to the strongest in a nanosecond Intriguing storyline, strong characters ( I would like the male protagonist to be stronger but I understand he has't been trained yet so) I love fantasy books and these kind of lovely book cover so this can't really go wrong with me. It is possible for you to be confused at the first few chapters, but you'll be fine! Don't worry. I like how the male protagonist develops his powers slowly, in a more realistic pace. Unlike some other books that went from a poor guy to the strongest in a nanosecond after the big revelation . I absolutely loved the characterization. The self-reflective male protagonist (Ealdred) was a nice change from the many headstrong or confident male characters out there, but my favorite character by far was Bellator, for the complexities and subtly-hinted-at backstory. Truly a character well woven. There were times when I was a bit confused as to the current step in the overall plot, but the action, relationships, and plot twists kept the story moving swiftly enough that I never felt lost in wha I absolutely loved the characterization. The self-reflective male protagonist (Ealdred) was a nice change from the many headstrong or confident male characters out there, but my favorite character by far was Bellator, for the complexities and subtly-hinted-at backstory. Truly a character well woven. No Spoiler Review. Imaginative. Rolling out with a good pace, in a well constructed world, Broken Arrow managed to subvert my expectation! It answered important questions set from the beginning, while raising more questions in the end...questions that need answering, begging for further adventure. Well done! Won this here on goodreads. I LOVED this book. I struggled with the cruelty to children in this book, but I understand it was part of the story. Well executed characters and story line. It only became predictable when the pieces were pulled together. Can't wait to see how the rest of the series plays out! The book starts at a council of Gaiztoak meeting where Zeldek tells of how the world is coming to dangerous times and the boy needs to be brought in and give allegiance to him. He is found as a slave and taken after a battle against his will. He is brought to Zeldeks castle and locked up until he decides to submit. I really enjoyed this book. The scenes were so beautifully described. The book moves at a great pace. I loved Bellator. She is not as she seems in the beginning. Ealdred has a strengt The book starts at a council of Gaiztoak meeting where Zeldek tells of how the world is coming to dangerous times and the boy needs to be brought in and give allegiance to him. He is found as a slave and taken after a battle against his will. He is brought to Zeldeks castle and locked up until he decides to submit. I’ve been getting a lot of fantasy showing up in my inbox lately and Broken Arrow has left me with no regrets! What a wonderfully written and deeply moving story! There are so many times where, as an editor and a book blogger, I begin to feel weighed down by my work. I start treating the books I read as chores and simply plow through them, sketching down notes of every error and dislike I come across while reading. But every so often I am brought back to the time I read for fun—back when I enjoy I’ve been getting a lot of fantasy showing up in my inbox lately and Broken Arrow has left me with no regrets! What a wonderfully written and deeply moving story! There are so many times where, as an editor and a book blogger, I begin to feel weighed down by my work. I start treating the books I read as chores and simply plow through them, sketching down notes of every error and dislike I come across while reading. But every so often I am brought back to the time I read for fun—back when I enjoyed books for the simplicity of enjoyment. Where I was taken to another world against my will and found myself lost in the exciting imagination of a person I do not know. I miss those days, and sometimes I feel like my work has taken me away from those days for good. But I was so happy to have come across Broken Arrow because it took me back to my imagination—to the depths of creativity that’d been lost in the slush pile of work, endless list of emails, and monotonous editing. Broken Arrow is an expertly written and wonderfully imagined novel by Azaria MJ Durant. It follows the story of a young slave boy with all the odds stacked against him. In a world where slaves are hated, magic is illegal, and war is ripping the land apart, Ealdred must find a way to overcome it all. Yes… the story has a bit of an ‘underdog’ feel to it as Ealdred is one of those protagonists you would least likely expect to make a difference in this very complicated world, but it plays out very well. The entire story and adventure are detailed and easy to follow; action sequences flow wonderfully and character development is so strong it forms a bond that will have you dreaming of your favorite characters while you sleep! Pleasant dreams of freedom, magic, and the fight of good versus evil. With all the praise I’ve given this story, I still have to say there are some things I dislike. For fantasy, I feel the story is very short and as I mentioned before, it follows a very cookie-cutter routine by taking a weak and unlikely character and molding them into the hero we need. While it is certainly written well and deserves every star I’ve given it, I will say I wish the plot wasn’t so cut and dry. It feels like another VERY GOOD version of a story you’ve heard before. That being said, I don’t know what could be changed to take away the feeling of having read this before. Broken Arrow is good enough as it is, nothing *needs* to change but I am more than interested to see how things will play out from here. Broken Arrow is among the best books I've ever read. Ealdred is an amazing main character, and the journey he has to undertake is equally awesome. I highly recommend this book to anyone who likes fantasy. Azaria M.J. Durant is a passionate writer of fantasy with plans to branch out into sci-fi and dystopian. She enjoys writing stories with lots of adventure, unexpected twists, and fleshed out characters that challenge gender roles and expectations. Azaria is currently traveling North America with her family in an RV. In the moments when she isn’t writing, she is sketching concept art for her stories Azaria M.J. Durant is a passionate writer of fantasy with plans to branch out into sci-fi and dystopian. She enjoys writing stories with lots of adventure, unexpected twists, and fleshed out characters that challenge gender roles and expectations. Azaria is currently traveling North America with her family in an RV. In the moments when she isn’t writing, she is sketching concept art for her stories, chatting with friends, or curled up with a good book and a box of mint chocolates.